At camp, we use engaging experiences to synergize teams. Our team building adventures are designed to help teams overcome the challenges that organizations face in an ever-changing world. A group typically goes through five stages: forming, norming, storming, performing, and closure. Our staff carefully guides groups through each stage, showing them how to successfully negotiate the transitions and grow as a team. Our program succeeds because each group progresses through a structured outline of activities. Our facilitators explain the activity, the participants complete the activity, and the facilitator and participants debrief the activity. We offer one, two, or three-day programs, each of which is tailored to the needs of the specific organization. In the initial stages, the group learns about the basic goals of team building, the importance of honesty, listening, and caring about other individuals, and motivation to interact with everyone on the team. 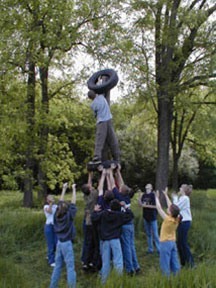 During the middle stages, the group learns communication and trust, problem-solving, and how to turn disagreement into positive team building. In the later stages, the group applies what its members have learned to scenario-driven problems. Groups who excel during the problem-solving activities are tested by higher-level problem-solving activities. Contact us for more information about our team building programs.